Malberg castle is one of the extra ordinary buildings of the Kyllburg Eifel-forest, a part of the Eifel-mountains. The today palace is based on a castle mentioned 1008 the first time. In 1681 the Veyder family take over the castle and convert it to a venetian style château by Earl Matteo Albert form 1708 to 1715. This is unique around Trier, the next major city. 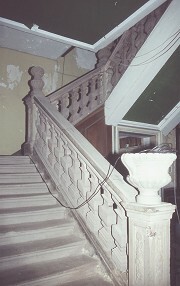 The representative building owns plastered ceilings and wood planking as well as old paintings and ancient furniture. Unique is a wall carpet showing hunting sceneries. The complex has not converted in basic parts since the 18th century. 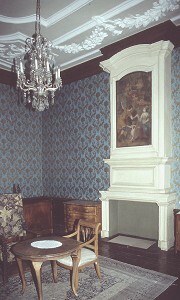 Even the ancient furniture we found “in situ” in 1997. 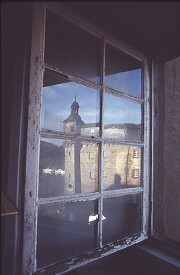 In 1990 the castle becomes public property. By the mid of the 1990th these ordered a complete documentation to reconstruct its essential parts. The façade has been documented still in analogue way by the photogrammetric office Fischer in Freiburg.